In the months since the U.S. Supreme Court handed down a landmark decision that precluded public sector unions from imposing "fair share" fees on nonmembers, a number of lawsuits have been filed in Pennsylvania by state employees over the practice. But one case that has been ongoing for almost five years was also affected by the Janus v. AFSCME ruling, and it entered a new phase when an appeal was filed in the Commonwealth Court of Pennsylvania seeking to overturn a lower court dismissal. The Fairness Center, an organization that provides legal representation to public sector workers who feel they have had their rights violated by their unions, first filed suit in September 2014 on behalf of four Pennsylvania teachers against the Pennsylvania State Education Association. The teachers had sought to make use of a provision that allowed their fair share fees to be allocated to a charity instead of to the union, but according to their lawsuit, the PSEA refused to disburse the funds because the charities didn’t advance pro-union policies. Over the course of the various legal wranglings, the PSEA eventually returned the funds it had collected from the teachers, but the Fairness Center is still seeking a ruling on behalf of clients Jane Ladley and Christopher Meier that the union had acted inappropriately so that other public sector workers don’t find themselves in similar circumstances. In appealing a previous ruling that dismissed the case, Fairness Center attorneys noted that the PSEA is continuing to include fair share fees in collective bargaining agreements despite the Supreme Court’s ruling. "If the trial court’s erroneous decision is not reversed, section 575 will remain ‘on the books’ and fair share fee clauses will remain in PSEA’s collective bargaining agreements, contributing to confusion and providing an avenue for PSEA to return to its allegedly abandoned policies," the plaintiffs’ appeal notes. "Indeed, PSEA left a fair share fee clause in Mr. Meier’s collective bargaining agreement and continues to bargain for fair share fees in collective bargaining agreements executed well after Janus was decided." The notion that unions in Pennsylvania were still looking to impose fair share fees was astonishing to Charles Mitchell, president and CEO of the Commonwealth Foundation, a nonprofit public policy organization. "This is a slap in the face to public schoolteachers," Mitchell said in a news release. "By ignoring the Supreme Court’s ruling, teachers’ union leaders are repudiating the constitutional rights of nonmembers. It’s outrageous that unions are inserting blatantly unconstitutional language in teacher contracts." 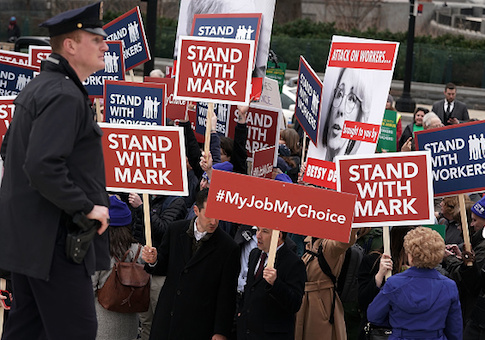 The foundation’s release noted that state Rep. Kate Klunk’s House Bill 785 would go a long way toward solving any post-Janus confusion by repealing state laws that conflict with the high court’s ruling and by ensuring state workers are notified of their rights. "Union leaders are trying every trick in the book to keep workers in the dark about the rights restored to them by the Supreme Court," Mitchell said. "Enough is enough. It’s time for lawmakers to stand up for government workers and pass legislation to notify them of their true rights when it comes to paying a union." This entry was posted in Issues and tagged Supreme Court. Bookmark the permalink.